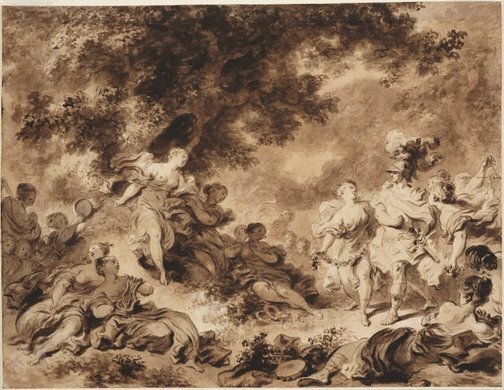 Fragonard spent almost six years in Italy and this drawing takes as its subject an episode from the Italian writer Tasso's epic 'Jerusalem delivered'. Having fallen in love with the Christian warrior Rinaldo, Armida entices him into her enchanted garden to prevent him returning to the war. Lully's opera 'Armide' was performed in Paris in 1761, and this perhaps partly inspired Fragonard. It is not certain whether this drawing - and its pendant 'Rinaldo in the enchanted forest' - were done before or after the two oil paintings of the same composition. This wash drawing gives the effect of a painting. Fragonard was the typical Rococo painter of lighthearted and gallant subjects during the reigns of Louis XV and Louis XVI. The French Revolution put an end to his patrons and Fragonard died almost forgotten. Renée Free, Forest and field: from Claude to the Barbizon School , 'Rococo landscape', pg. 2-3, Sydney, 1995, p 3, p 6. Renée Free, AGNSW Collections , 'The Western Heritage, Renaissance to Twentieth Century', pg. 108-172, Sydney, 1994, col illus p 123. Prints & drawings Europe 1500-1900 , Sydney, 2014, col illus pp 88-89, p 90, coll illus p 91.